But what's Google getting out of the relationship? Thermostats were never destined to be 'cool' tech, but Nest set out to prove everyone wrong. The company's Learning Thermostat, which brings its smarts to the UK today, is a more intelligent approach to home automation designed by ex-Apple man and the 'Podfather' himself, Tony Fadell. 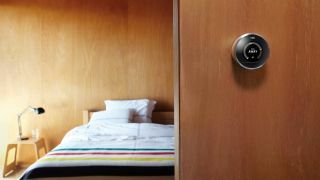 So it's no surprise that Nest's Apple roots are still showing - and as Maxime Veron, Director of Product Marketing, tells TechRadar, the company still takes a very Apple-esque approach with its "vertical" approach to combining hardware and software. "Most home automation companies are trying to push a bundle of hardware that usually they don't even make themselves," says Veron. "And they slap on top of it some home automation remote control applications that they usually outsource to someone else. We don't believe that's the right approach." He also adds that "there should be a network effect that comes de facto" if you have several Nest products in your home. Google's purchase of Nest Labs won't have pleased Cupertino all that much (Phil Schiller even unfollowed Fadell on Twitter after the buyout) but that's hardly a concern for a company that now has access to Mountain View's technology trove. "We now have the ability to accelerate the roadmap and get to more countries faster," says Veron. "The current plan is to keep working separately [to Google] but we now have access to many engineers, and there are so many projects going on that we can tap into the resources of. "We went from 300 to 380 people in just a few weeks thanks to them because they put recruiters at our disposal and people internally wanted to transfer." Veron also thinks Nest has found a shared ethos with Google which will be vital for the two working together in the future. "We have something in common with Google which is that technology should disappear behind the benefits customers get out of it. There's so much high tech built into the product from a hardware point of view, a software point of view, but at the end of the day all customers need to know is turning the temperature up and down and that Nest will create a schedule for you." Naturally, being eaten up by Google has lead to widespread concern that Nest will hand our data over to the big G. But Veron reinforces that there remains a healthy distance between Nest and Google that means none of your information will go beyond Nest. "About three or four months ago there was a team of hackers that tried to break into connected thermostats and they were able to get into pretty much every one of them except for Nest."